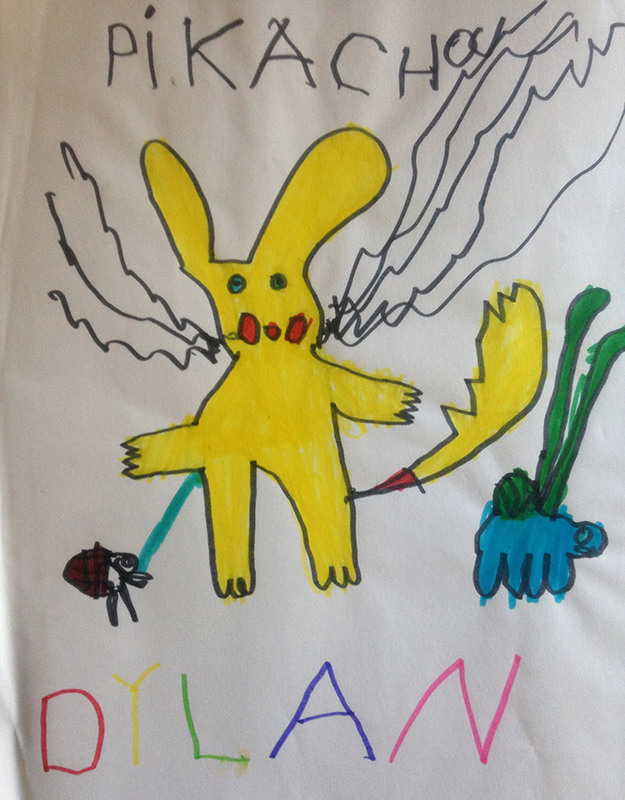 All of Dylan Eurlings’ artwork is just phenomenal. He’s a digital 2D game artist by trade and has worked on many modern games from studios in France & Spain. In this interview Dylan is kind enough to share his journey into the gaming world explaining how he went from a kid who loved drawing into a professional concept artist, illustrator, and game UI designer. Plenty of great advice & inspiration here for anyone hoping to break into the industry and work on video games for a living. What are some of your earliest memories of drawing & painting? When did you start taking art seriously & decide to follow art as a career? For as far as I can remember I have always loved drawing. When I was around 6-7 years old Pokémon came out. Like many kids, I was really into it and I remember drawing them all the time. I was also drawing a lot of pirates, cowboys, aliens and knights. I would always invent crazy stories and sometimes even write them alongside the drawing, to make sure the message was clear(of course it never was). I didn’t take drawing seriously until high school I think. It’s when you have to choose what you are probably going to do for a big part of your life, even though you are barely starting to understand how life works. Dylan, you stupid teenager, what do you like to do? And the answer was simple: I like to draw and to play video games. I don’t remember exactly how, but at some point, I managed to connect the dots and it became extra clear that I wanted to create video games. I had already attempted with more or less success to create some small games, but it was only from this point that I switched from considering it as a hobby to a potential career. Are you a self-taught artist or did you attend university? And do you think a modern artist needs a degree or is it possible to learn everything online? 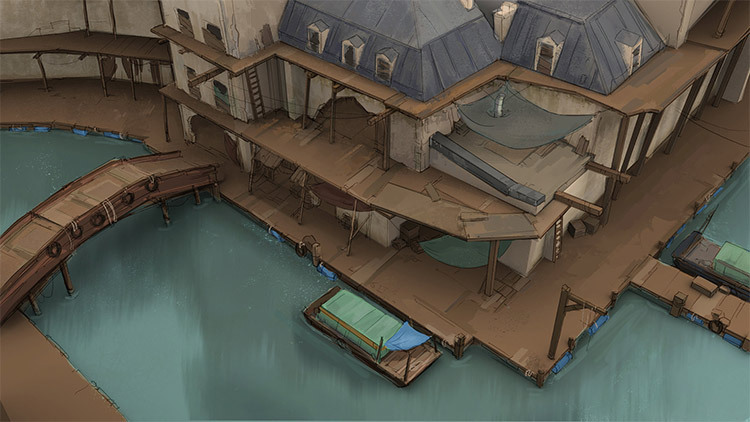 I went to a school in Paris called ISART Digital where I followed the game art course for 5 years. 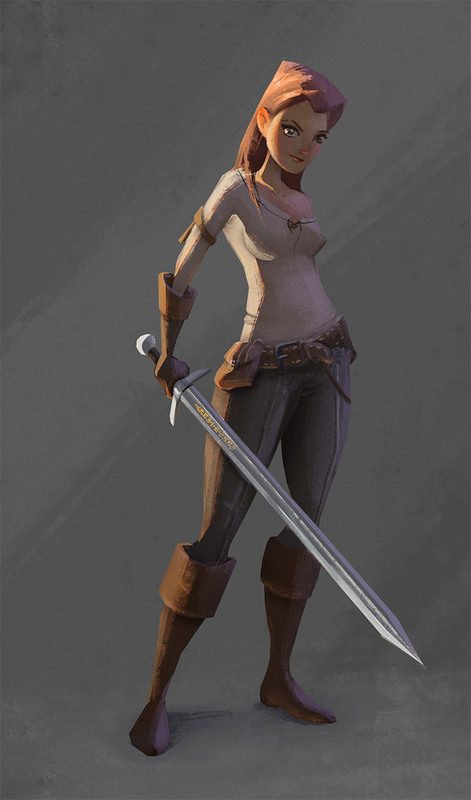 I learned about 2D and 3D game art, concept art, animation, illustration, etc. We made a lot of projects and among the teachers were some really amazing people who taught me a lot. I also made many friends and professional contacts there. I actually think this is one of the biggest pros of going to school: you get to meet a lot of awesome people. Now, would I have been able to become a professional artist without those 5 years of school? Maybe, I don’t know. For sure the resources to learn are easily accessible online for a very small amount of money compared to the cost of an art school. I actually learned a lot from the internet on top of the education from my school. The thing is, choosing the self-taught way will require you to have very high personal organization skills, motivation, and dedication. I don’t know about online courses and mentorships. I’ve heard and read good things about these. There are some amazing artists that are doing online classes nowadays. Maybe it can be a good alternative to regular school. Can you share a little about the European game industry? 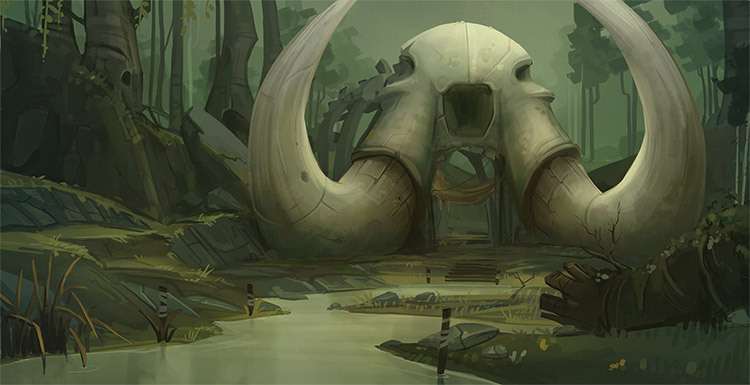 How much work is out there for concept art & do you think it’s getting larger? I only know about the game industry in France(especially in Paris) and since I only started working 5 months ago in Barcelona, I know very little about Spain yet. For sure there is work and the industry is growing really fast. 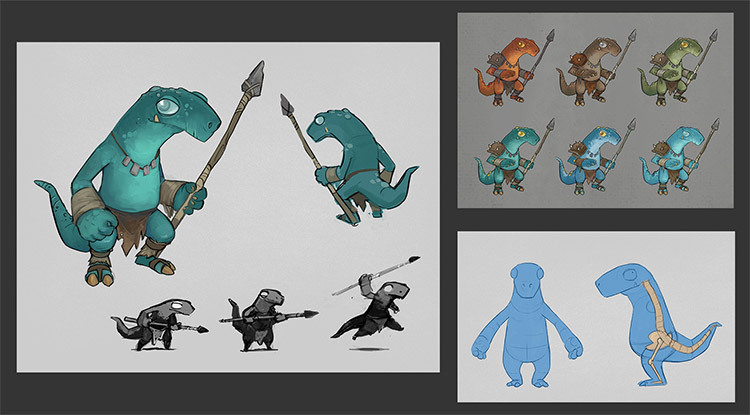 But there is also a looot of people looking for jobs in concept art and game art. So you have to stand out. Do you still remember your first professional art job? What was that like? My first paid job as a game artist was an internship in a studio called Bulkypix. I was working as a 2D game artist on a project that will sadly never be released. This happens sometimes. The experience was great anyway. It was my first time working under the direction of an art director. It was also the first time I had the feeling of working on something bigger than myself. I was contributing to this project with other artists who had more experience, but they trusted me. I had to make actual decisions on how the game would look. It was pretty cool. After that I started doing some freelance jobs. I had one experience of working remotely on the game Seasons After Fall. Contributing to this project was awesome, but it also made me realize that I don’t like to work from home. I lack the organization, work environment and human contact that you get when you work in a studio. I then worked on a mobile game called RedStory and I am now working at ZeptoLab on a new awesome project. I learned a lot through all of these experiences. I got to work on many different games, in many different styles and work environments. This allowed me to understand what I really like to do. 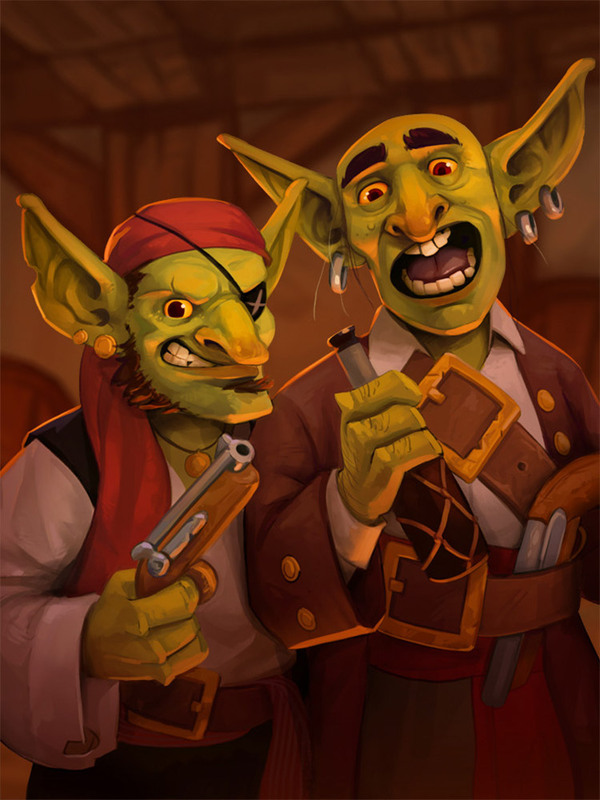 What sort of game graphics & game art do you typically design(characters, environments)? I usually work in small teams as a 2D game artist. My job is not only to make the game as appealing as possible, but also and most importantly to make it easy and clearer to play. I used to work in a very handpainted style. I am now learning a vector-based approach with strong simple shapes and limited color palettes. The ultimate goal though stays the same: trying to find the nicest shapes, the right amount of detail, and the juiciest colors. I do all of my game graphics in Photoshop from the concept to the final art. For animation I use Flash(now Adobe Animate) most of the time. I have a pretty simple and regular workflow, no big tricks or fancy tools. What’s your creative process when designing a new piece? Do you look for inspiration first or just start sketching ideas? It really depends on what I’m working on. If it’s something simple that I know well or I’m used to drawing, I might just start sketching and then look for reference or inspiration if needed. If it’s something totally new, a style or subject I am not familiar with, I will start by collecting references. This will feed my brain with visuals and it will be easier to see what I want to do before sketching. I usually also create a moodboard and put it on a different screen or window. I can look at it when drawing to get ideas, remind myself of how something looks or simply check that I am still going in the right direction. Do you practice drawing from life or do you mostly focus on illustration work? And do you think life drawing is valuable for someone who wants to get into game art? I try to practice both. When I was living in Paris I had to take the metro for 30-60 minutes to get to work. When I was not sleeping I would always have a sketchbook with me to draw people. This might be the only upside of taking the Parisian metro. There are a lot of very different looking people to draw and most of the time they don’t even pay attention to you, or at least pretend not to. I now try to go out in the city to sketch sometimes but I should definitely do it more often. Drawing from life will fill your mind with visuals and help you understand how things work. If you draw people, you will draw a lot of different faces, bodies and clothes. Having all of this material in your mind will improve your character designs. Same goes for environments. When drawing from life you learn about perspective, shapes, maybe composition, lighting, etc. How important is meeting people & networking for landing art jobs? In my opinion, it is essential today to be active online. It’s the best way to connect with other professionals, at least when you are starting. I actually found most of my jobs via websites and social networks. I am now using ArtStation for the more professional work and Instagram for the more personal work. You don’t have to be everywhere. More than 2 or 3 platforms is too much to handle for me. But I believe it is important to have an online presence. You never know who will stumble upon your work. What’s the studio pipeline for the games you work on & how many people are on your team? Right now I am working on a new game within a team of 9 people. I joined the project in the early stage of production, so I started by doing some concept art and mockups while the developers were working on the prototype. I am now working with the lead artist and the game designer to create the actual game assets. We start with very rough versions of these assets to have a quick look of how it looks in-game. Then we basically keep iterating until it looks how we want and feels good to play. Do you think an artist can keep a career doing just 2D art nowadays? Or do you think newer artists should learn both 2D & 3D skills? I work on 2D games and so far I never really had to use 3D for work. So yes, I believe it is possible to keep a career doing just 2D art. However I did learn a lot about 3D in school and I think it is a big plus to have. I might need to use 3D in the future and I use it sometimes for personal work. You can use 3D in a lot of ways to make your life easier when doing concepts or illustrations. It can help you to draw complex perspective or to easily draw the same object from different angles. If you are working on 3D games as a concept artist, then even if you don’t actually use 3D in your process it’s good to know how it works. Knowing what your colleagues are doing after you give them your concepts will help you create better designs. In any case, I think knowing at least the basics of 3D will be useful at some point in any 2D art career. Outside of art what else do you like to do? One thing I love, aside from art and videogames, is aggressive skating. If you don’t know about this sport don’t worry; it’s not as brutal as it sounds. It consists in doing figures in rollerblades. You could say the goal is to master as many tricks as possible. 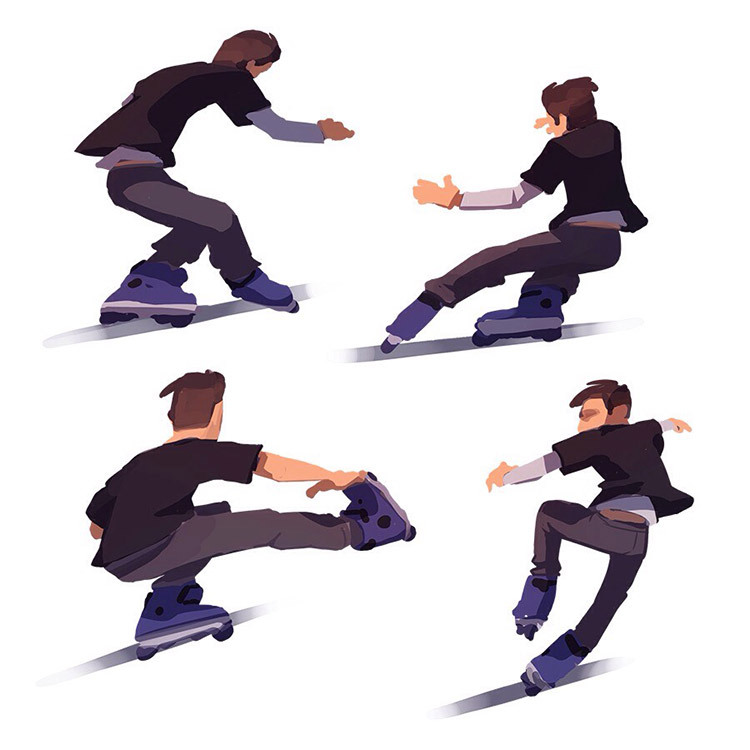 Doing a trick is all about finding the perfect movement, speed, and position with your body. I think in many ways you could compare it to dancing for example. Whenever I find the time I grab my blades and go skate the streets or skate-parks. Any final advice you can share for aspiring concept artists & game artists? If you ever feel hesitant or discouraged try to remind yourself of why you’re doing this. Keep learning, be curious and open-minded and everything will work out alright. And most importantly: enjoy life! Special thanks to Dylan for making time to for this interview. Really appreciate his perspective coming from the European game industry. If you want to learn more you can visit his main website or check out some of his work on ArtStation. He also shares frequent updates on social networks like Instagram and sometimes posts on Twitter @dylaneurlings.